Ants are wondrous creatures and one of the most successful animals on earth. In nature, ants are a prime food source for many animals. They aerate more soil than the earthworm, they have taken advantage of every conceivable environmental niche and can be found in every region of the world except the polar caps. The presence of ants in nature ensures the health of the natural environment. In homes and other buildings, however, ants are not so welcome. The same reasons ants are successful in nature makes them very well suited to sharing man's living quarters. Structures can be threatened by damage from carpenter ants. Pharaoh ants can carry disease organisms. The stings of fire ants can threaten a person's health. Determine where the ant colonies are located. Use baits for ant colonies that cannot be treated directly. It is not always possible to find where the ant colony is located. In this case, bait insecticides placed directly in the path of ants or where ants can find them are very effective and can save a tremendous amount of time. Practicing a few proven field tips can save time in uncovering the source of an infestation. CARPETS - Most pest ants like to trail under the edge of carpets. Inspect along the walls under the carpet beside the tack strip. A good place to start is in front of fireplaces and sliding glass doors. When foraging ants are found, try to trail them back to their colony location. FOUNDATIONS - When ants are found inside along exterior walls, look for colonies living in the soil beside the foundation. VEGETATION - Ants like to nest and forage in trails out of sight behind any vegetation which rests against foundations, patios, etc. Pull back the vegetation to look for ants. Attempt to follow foraging ants back to their colony. GROUND SURFACES - Any item sitting on the ground could harbor a colony of ants. Check under all items, especially those near the foundation. 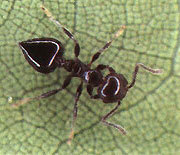 MULCH - Mulch often harbors numerous colonies of ants such as pavement ants, fire ants, crazy ants and Argentine ants. Rake mulch back from the foundation to check for colonies. Don't Buy Retail Ant Baits From Hardware Stores! Most over the counter baits sold at hardware stores and retailers do not contain the same attractants or active ingredients as professional use baits. Although the packaging and advertising may appear convincing, millions of dollars are wasted by consumers annually on over the counter ant bait products that simply do not work. For this reason, ePestSupply is committed to offering only the finest Professional Quality ant bait products and at the lowest possible price. There are 3 species of fire ants that are common to the Southern US. The red imported fire ant, the imported fire ant, and southern fire ants. Fire ants are a significant health threat due to their stings. Regular outdoor applications of pesticides to lawns and foundations are often necessary because re-infestation from neighboring properties is common. The key to fire ant control is to locate all mounds and treat them and then prevent their reoccurence with Insect Growth Regulators such as Award II Fire Ant Bait. Mounds can be treated by drenching with liquid insecticides such as Demon WP or Talstar or by baiting such as with Advion Fire Ant Bait contains Indoxacarb. Indoxacarb is carried by back to the ant mounds by the workers and then fed to the ant population. It is then spread throughout the colony by means of food sharing by the worker ants. This slowly wipes out the entire population including the queens. Indoxacarb is non-repellent to the ants which means that they cannot sense that there is a pesticide or toxicant present which greatly encourages feeding and the consumption of the bait. Advion Fire Ant Bait is the fastest active Fire Ant bait on the market and kills all life forms of ants within 72 hours of application. An Application of a fire ant bait containing a growth regulator such as Award II Fire Ant Bait to the entire lawn helps limit re-infestation of treated areas. This works especially well on large lawns, acreages, golf courses, pastures, etc. 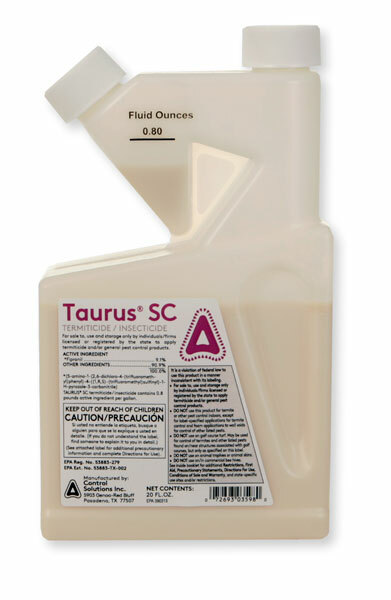 A outdoor perimeter application of a liquid insecticide such as Taurus SC or Talstar helps to prevent their entry into homes. In slab foundations, fire ants can nest indoors in wall voids by entering the structure from below and following plumbing lines in. Bath traps, shower stalls, and hot water heater walls are particularly well suited areas for fire ants. Carpenter ants can usually be controlled by finding and treating their colonies located in wall voids and wood. Drilling and dusting of infested walls and voids with insecticidal dusts such as Tri Die, Timbor or Borid is very effective. In areas where carpenter ants are abundant, or where the nest cannot be located, baits such as Advance Carpenter Ant Bait are very effective. Perimeter treatments with a liquid spray such asTaurus SC, Demon WP or Talstar will help prevent ants from entering. Applications with Demon WP or Talstar to trees where colonies are located are also helpful. Outdoor baiting such as KM ANT PRO BAIT STATION with Gourmet Liquid Ant Bait is the most effective long term solution. Visit our Carpenter Ant / Wood Ant Page To Learn More Click here to go to Carpenter Ant Main Page. 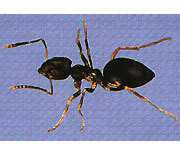 Acrobat Ants are similar to carpenter ants but are much smaller in size. They nest in old carpenter ant galleries, termite galleries, in voids and in insulation. The key to identifying acrobat ants is to look for a heart shaped abdomen that is often raised well above the main body. This raising of the abdomen is a defensive mechanism that acrobat ants use to fend off their enemy. The same treatment techniques that apply to Carpenter ants apply to Acrobat ants. Outdoor baiting such asKM Ant Pro Ant Bait Station with Gourmet Ant Bait is the most effective. Pharaoh ants can only be effectively controlled through a comprehensive baiting program. Treatment with liquid insecticides actually makes the infestation worse by causing the ants to "bud" or "split" into several smaller satellite colonies. There are many excellent baits on the market for pharaoh ant control. The more successful baits such as Dual Choice Ant Stations and Maxforce Professional Ant Stations contain special attractants. They also contain a slow acting poison that gives the worker ants time to get back to the colony and feed them. Again, it must be emphasized that spraying makes pharaoh ants worse. In areas where Pharaoh ants do not respond to baits, Meteor Ant Growth Regulator may be the answer. Meteor contains "Methoprene" an ant growth regulator. Using growth regulators for ants will result in sterilization of the queens and ultimately elimination of the nest. Another indoor alterative for Pharoah ants is the application of Phantom Insecticide. Phantom Insecticide is an odorless, non-repelling spray the kills ants within a few weeks of application. Phantom works by entering the ants nervous system through grooming and food sharing and then systematically kills the ants through a degeneration process. Phantom is very effective at controlling most hard to kill species of ants. Outdoor baiting such as KM Ant Pro Ant Bait Station with Gourmet Ant Bait is the most effective. Little black ants most often forage inside structures from colonies located outside. Location of nest or colony and it's treatment with a residual spray such as Phantom , Demon WP or Talstar or dust such as Tri Die , Timbor or BorActin Dust will provide good control. Try following the ants back from the food source. Dusting the voids of outside ground-floor walls and infested interior walls along with the outside spray treatment is effective. Baiting with the recommended baits is also effective. Treatment with a residual spray along foundations, and around windows are helpful in preventing foraging ants from entering. Outdoor baiting such as KM Ant Pro Ant Feeder Station with Gourmet Ant Bait is the most effective. Pavement ants like to nest next to and under sidewalks and other types of slabs. They often enter buildings through expansion joints in slabs. Application of insecticides through these cracks may help in controlling the colony beneath. In severe infestations, a slab floor may need to be drilled and treated by pumping chemical underneath with a specially equipped sprayer. 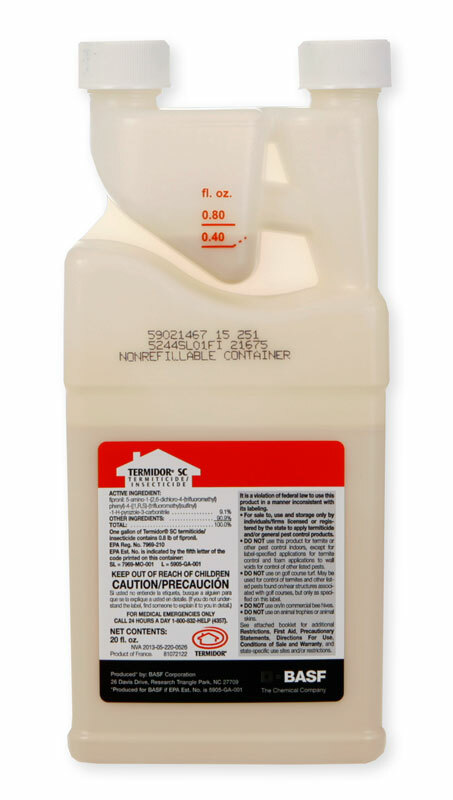 Outside perimeter treatments with products such as Termidor , Demon WP or Talstar are helpful in preventing re-infestation. Crazy ants are one of the most difficult ants to control in structures. Their colonies are often numerous and they are aggressive foragers. Perimeter treatments with a liquid spray insecticide such as Termidor , Taurus , Fuse , Demon WP , Talstar and Bifen are helpful where crazy ant colonies are abundant outdoors. Liquid baits containing boric acid based products such as Gourmet Liquid Ant Bait are more effective against crazy ants in the long term. Caribbean Crazy Ants and Crazy (Tawny) Rasberry Ants are especially hard to control because of their ability to establish huge colony structures and infest acres of area at a time. These exotic and invasive ants are attracted to electrical current much like the imported fire ant and will infest electrical equipment, computers, TV's, transformers, etc. The shear numbers of ants present in these devices will sometimes cause an "arc" of electrical current that will short out the device. NASA in Houston, Texas recently experienced Crazy Rasberry Ants. The ants apparently infested 3 computers causing them to short out. 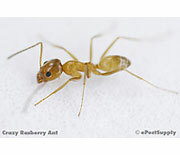 Crazy Rasberry Ants are found in Texas in counties near Galveston and Houston. Caribbean Crazy Ants are found in Florida and along the gulf coast. Termidor is effective against both ant species but can only be applied around the exterior of structures. KM Ant Pro is highly recommended and will kill both Caribbean Crazy Ants and Crazy Rasberry Ants. Liquid outdoor baiting with the KM Ant Pro Ant Bait Station and Gourmet Liquid Ant Bait is the most effective solution available for Caribbean crazy ants and Crazy Rasberry Ants. Solid baits and granules are not effective and will not work against these exotic and highly invasive ants. Odorous house ants get their name from the fact that workers give off a rotten coconut odor when crushed. 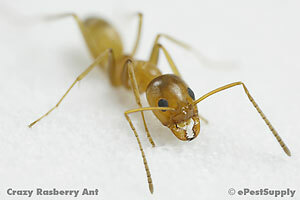 They are often confused with the Argentine ant except their one node is flattened, not pointed, and it is not visible from above or the side because it is hidden by the abdomen. They are small, brown ants about 1/8-inch (3 mm) in length. Workers of the odorous house ant are all one size. The odorous house ant is closely related to the ghost ant but is easily distinguished by size and coloration Ghost ants are considerably smaller and have a dark head and thorax and pale, almost translucent, abdomen and legs. The antennae of both species have 12 segments and no club. Odorous house ants are found throughout the United States and from Canada to Mexico. It is a major structural pest in California, particularly in central and Northern California. Its presence in Southern California is less frequent in areas populated by Argentine ants. It is also found up the gulf coast into Oregon and Washington. In the mid-south region of the U.S. in northern Mississippi, west Tennessee, and Arkansas, it is the primary pest ant invading buildings. It will also occasionally be found infesting structures throughout the lower Midwest. Odorous house ants rival Argentine and crazy ants in their persistence in invading buildings. Its basic biology and habits are similar to those of the Argentine ant. As seen with many successful tramp pest ants, this species has multiple queen colonies numbering tens of thousands of workers. Huge extended colonies, or "super-colonies of foraging trails along which workers, food, and brood (larvae and pupae) are exchanged. 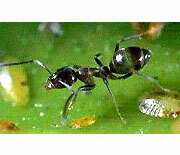 The workers from separate colonies are antagonistic to each other so separate colonies will not integrate and split apart as is seen with the Argentine ant. Workers and queens may live for several years. Colonies also frequently occur under the loose bark of trees, in cavities in trees, and in bird and animal nests, including honey bee hives. The colonies locate themselves in the top of the hives, apparently for the warmth the hive produces. The ants feed little on the honey even though they are ravenous sweet eaters. Inside they will commonly nest in wall voids, particularly around hot water heaters and hot water pipes. Dusting these areas with BorActin Dust will provide good control. Outside perimeter treatments with residual sprays such as Termidor , Demon WP or Talstar are especially helpful. Odorous house ants love sweet baits containing sugar and or honey such as the Maxforce Ant Killer Gel Bait or Gourmet Liquid Ant Bait . The Argentine ant is a small, light to dark brown ant about 1/8 inch (2.6mm) in length. They have been reported to crawl onto people and bite them while they are asleep. Reports from the early 1980's describe babies being attacked in their cribs. The Argentine ant is most often confused with the odorous house ant, but the node on the abdomen of the Argentine ant has a sharp, pointed peak, while that of the odorous house ant is flat in shape and is hidden. It may also resemble the Crazy ant and the Small Honey ant, however, the Argentine ant does not have a small circle of hairs on the tip of its abdomen. Argentine ants have multiple queen colonies and the queens will often be found along argentine ant trails. Occasionally, winged queens will be seen in a colony. The Argentine ant is important because it is ideally suited to urban environments. Where it occurs, it can be one of the most difficult pest ants to control. A single colony of Argentine ants can contain thousands of workers and many queens. The queens in an Argentine ant colony live about 1 year. A typical colony consists of about 90% workers and 10% Queens. Control of Argentine ants typically requires a thorough outdoor baiting treatment. 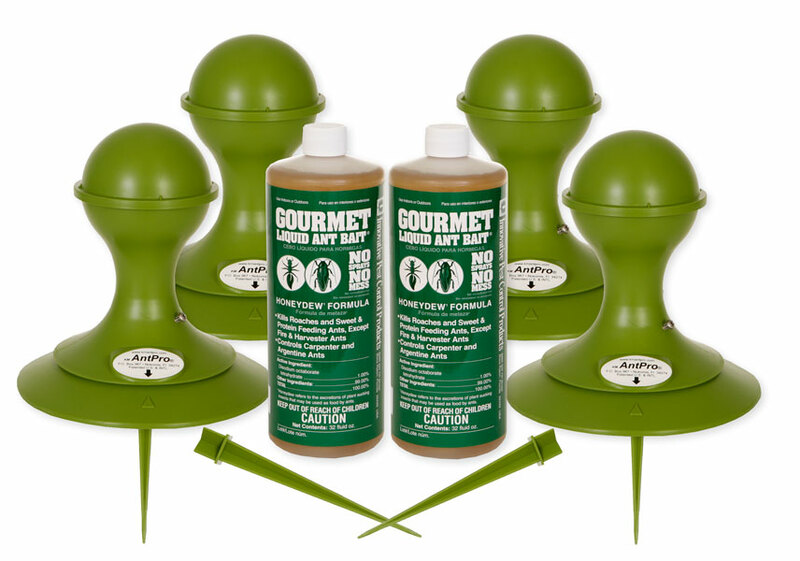 Outdoor baiting such as KM Ant Pro Ant Bait Station with Gourmet Liquid Ant Bait is the most effective. Visit our Argentine Ant Page To Learn More. Click here to go to Argentine Ant Main Page . The ghost ant is a very tiny ant less than 1/16-inch (2 mm) long that has a dark head and thorax and a pale colored, almost translucent, abdomen and legs. For this reason, it may also be called the black-headed ant. The ghost ant is related to the odorous house ant and resembles it except for the size and color. The odorous house ant is larger and is colored completely brown. Like the odorous house ant, ghost ant workers emit a rotten coconut odor when crushed. A colony of ghost ants may be moderate to large in size, containing thousands of workers and numerous reproductive queens. Colonies are typically located in sites that are too small to house an entire colony so the colony is usually divided into sub-colonies. The ghost ant's primary habitat is outdoors, and like most successful tramp ant species, it is highly opportunistic in its nesting habits. It will nest in soil, in debris in crotches of trees, dead tree limbs, under and inside logs, in and under firewood, and under stones. Indoors, colonies will be located inside walls, in boxes, between sheets, towels, and folded clothing, in waterbeds, and virtually any other dark protected site. One colony was discovered in a Miami home when the iron was plugged in and ghost ants poured out of the holes in the bottom of the iron! This ant challenges the Pharaoh ant for versatility in selecting nest sites. Ghost ants seem to have a high need for moisture. Ghost ants readily live inside wall voids, and homeowners often report seeing workers trailing out of electric outlet plates, particularly in kitchens and bathrooms. Like Pharaoh ants, these ants use electric wires to travel from room to room. By removing electric outlet plates and inspecting with a flashlight, foraging ants can sometimes be seen in these areas. These boxes can be baited with baits such as Gourmet Ant Bait Gel. Successful control of ghost ants depends on the ability to locate foraging ants and nesting sites. Ghost ant colonies living in the soil or under items, such as stones or logs, should be treated by drenching each individual colony with a residual insecticide such as Demon WP using a hand held sprayer or backpack sprayer. Ghost Ant colonies living inside wall voids can be treated by drilling a small hole into the wall and injecting a small amount of an aerosol or dust insecticide such as BorActin Dust . If the ghost ant colony cannot be located, outdoor liquid ant bait stations must be used. Sweet baits such as Gourmet Liquid Ant Bait seem to be preferred over other liquid baits by ghost ants.. Some experts have found that ghost ants respond better to granular ant baits such as Advance 375A Select Granular Ant Bait if the granulars are ground into finer, smaller particles. Outdoor baiting such as KM Ant Pro Ant Feeder Station with Gourmet Liquid Ant Bait is the most effective. Do not spray any repellent spray pesticides around Ghost Ants. Spraying will not kill the queens but will increase the egg laying and will only compound the problem. Only use liquid baits or non-repellent insecticides such as Termidor on Ghost Ants outdoors. 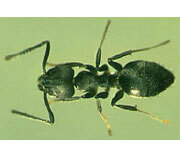 White-footed ant workers are about 1/8inch (3 mm) in length. The body resembles that of the crazy ants. The legs and antennal scape (first long segment) of this species, however, are much shorter. The key identifying character is the pale yellow coloring at the end the legs. This species also resembles the odorous house ant, except for the white-footed ant's darker color and light colored legs. 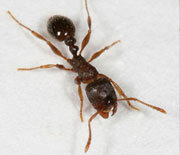 This ant is a pest in south Florida in Dade, Broward, and Palm Beach Counties in south Florida. It also has been found in Naples, Fla., and Sarasota, Fla. It is a pest on Oahu in Hawaii, and established colonies have been found in San Francisco, Calif. It is now an established pest of structures in south Florida, and it may very well be the most difficult structure-infesting ant to control where it occurs. Many pest control experts have literally "thrown up their hands" in surrender when attempting to control this species. The white-footed ant appears to be more of a pest of homes than of commercial buildings, but given time this species should become more widespread in its range and infest all types of structures. Huge colonies containing several million adults are formed and winged females emerge annually in large numbers from late May to mid June. Colonies that have multiple queens and also contain "intercastes" that have the characters of both queens and workers and which can produce eggs and assist in colony reproduction. The colonies can be huge and eventually contain up to one million individuals. Almost half of the colony consists of workers; the other half is made up of "intercastes" (wingless males and females). Satellite colonies are formed and connect together by foraging trails, creating a large extended colony or "super-colony." A single extended colony of this ant has been observed to affect numerous adjoining homes, thus confounding control efforts directed at single dwellings. White-footed ants are particularly fond of sweets and, like many ants, will tend and protect aphids, mealy bugs, and scales that produce "honeydew." A unique observation is that no oral exchange of food seems to occur among adults of this species. Nutrient transfer occurs via specialized trophic eggs that are produced by all females ( queens, intercastes, and workers). These trophic eggs serve as the food source for the intercasts that do not forage. For this reason, baits prove to be ineffective because only foraging workers may be killed, not the other half of the colony - the queens and intercastes that do not forage. Outside, trails of white-footed ants will usually be quite visible on walkways, foundations, and the sides of buildings. Once a trail of ants is found, workers carrying bits of food or whose abdomens appear swollen with food or water will usually be returning to the colony. The trail should be followed in the direction in which these workers are heading. Successful control of White Footed ants depends on the ability to locate foraging ants and nesting sites. White Footed ant colonies living in the soil or under items, such as stones or logs, should be treated by drenching each individual colony with a quality residual insecticide such as Fuse Insecticide using a hand held sprayer or backpack sprayer. White-Footed Ant colonies living inside wall voids can be treated by drilling a small hole into the wall and injecting a small amount of a dust insecticide such as BorActin Dust . Be sure to use a good duster such as the White	Crusader Hand Duster . If the White Footed ant colony cannot be located, outdoor liquid ant bait stations must be used. 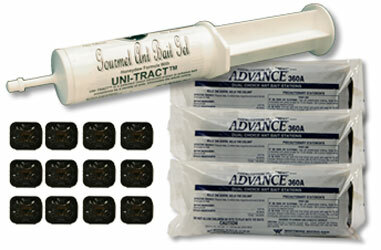 Sweet baits such as Gourmet Liquid Ant Bait seem to be preferred by White Footed ants. Some experts have found that White Footed ants respond better to granular ant baits such as Eclipse Professional Insect Bait if the granulars are ground into finer, smaller particles using a coffee bean grinder. Do not spray any repellent spray pesticides around White Footed Ants. Spraying will not kill the queens but will increase the egg laying and will only compound the problem. We recommend to use liquid baits on White Footed Ants outdoors. Thief ants are tiny ants less than 1/16inch (1.3 to 1.8 mm) in length, probably the smallest ants found infesting structures. The workers are light brown or yellow in color. The antenna has 10 total segments and ends in a 2-segmented club. The first segment of the antenna is about half the length of the head. It has a sting at the tip of the abdomen, but the sting may not be exerted and visible. The thief ant is most often confused with the Pharaoh ant which is the same general size and color. The primary difference between the two species is the thief ant has a 2-segmented antennal club while the Pharaoh has a 3-segmented antennal club. Thief ants are found throughout the United States. The thief ant is likely not a single species but rather a group of closely related species. It has been estimated that dozens of species and subspecies could be involved in this group. This ant is nicknamed a "thief' because it commonly lives near the nests of other ants and "steals" their larvae and food to feed its own colony. They enter the other ants' nests by means of tiny passages that are too narrow for the larger ants. 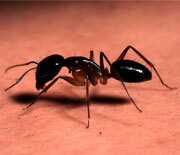 Thief ants may be considered beneficial because they kill and eat the immature forms of some pest ant species. In Florida, they are known to be predators of fire ant queens. A thief ant colony is relatively small, containing workers of one size (monomorphic) and many queens. The queens are about 1/5-inch (5 mm) in length. In one study of this ant's biology, the queens were found to deposit 27 to 387 eggs which hatch within 16 to 28 days. Larvae may complete development in as little as 21 days, but this period may be greatly extended when the ants overwinter as larvae. The pre-pupal and pupal stage last from 15 to 38 days combined. As stated earlier, thief ants will nest in or near the colonies of other ant species. The author has discovered several colonies of these ants while collecting carpenter ants from wood in trees or logs as well as wood in structures. Nests outdoors may be located in the soil under items such as rocks or logs and inside decaying wood found in stumps and logs. Inside structures, thief ants will nest in a variety of locations including wall voids, cabinet voids, and behind baseboards. Workers forage in set trails which can be found along baseboards, inside cabinets and closets, and on walls. They can use electric wires to move from room to room and have been observed exiting from behind electric wall plates. Their trails are often in the same locations as those of Pharaoh ants. They can easily enter packaged foods due to their small size. Thief ants often feed on the larvae and food of other ants. They are also predacious on the immature stages of many insects. They will also feed on other food found within structures, such as dead insects and grease. 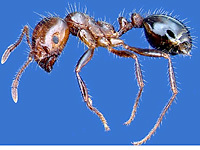 These ants have been observed feeding on the carcasses of dead rodents in buildings, and they are a concern in poultry houses where they will attack young chicks. They also feed on germinating seeds and the honeydew produced by aphids, mealybugs, etc. The first step when encountering tiny yellow ants in a structure is to identify whether the ant is a thief ant or a Pharaoh ant. The control procedures used for these two ants vary greatly. 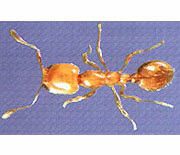 Once correct identification of the pest ant involved is made, an inspection can be conducted. Inside buildings, trails of thief ants may be found along baseboards, on walls, in closets, inside cabinets (particularly ones which contain food products), around sinks, and along window sills. Inspections should be focused in rooms where the customer has seen ants. If ants are found, an attempt should be made to follow the trail back to the nest location. Outside, inspections should be focused on finding possible ant trails on walls near windows and doors. In addition, foraging workers may be found trailing onto the building from tree and shrub branches which brush against the structure. Any item in contact with the soil, such as rocks, logs, and debris, could harbor an ant colony. The author has discovered thief ant trails by pulling the grass away from the side of patios and foundations. Infestations of thief ants are sometimes difficult to eliminate due, in part, to the fact that the colonies and the workers are small, thus making colony location difficult. Thief ant colonies living in the soil or under items such as stones or logs should be treated by drenching each individual colony with a residual insecticide such as Demon WP using a hand held sprayer or backpack sprayer. Thief ant colonies living in wall voids above or below cabinets can be treated by drilling a small hole into the void where the ants are living and injecting a small amount of dust insecticide such as Timbor or BorActin Dust . Want More Information on Ants ?